I was a lucky kid – grew up with a nearly same age brother, grandparents that took us fishing, and huge playground out my back door. Had a slingshot that once dropped a dove from the top of the old oak tree behind the neighbor’s house. Slingshots became bb guns or bows and arrows. Doves, quail and jackrabbits were at risk. Summer vacation meant a month in the mountains fishing for trout and chasing squirrels with grandpa’s Winchester pump .22 rifle. The next thing we were college age and spending our Christmas vacation looking for a way to hunt ducks in the grasslands. My military experience included college at Annapolis where fishing and hunting were not included in the curriculum, but I did manage to catch a couple largemouth bass in the Everglades, catch a few stripers in the Severn River and bag a buck with my Bear Grizzly recurve bow during my first 30-day vacation after graduation. Nuclear power school in Idaho Falls, Idaho put me into some good trout fishing on the Madison River, bird hunting for grouse in the sage brush to the east of town, duck hunting along the Snake River (where I finally saw my first white-tail buck) and a couple deer hunts, but once again other issues were primary and I had to settle for less outdoor time that I preferred. But I do remember almost freezing to death while chasing down an impromptu rooster that tempted me to leave the car without enough clothing. My submarine service was uneventful outdoor wise, until I was stationed in Maine for a year. I bought a 19-foot lap-side boat with a very scary 60-horse engine that never failed me. The coastal fishing was pretty good for cod, stripers, flounder and blue fish. I tried hunting white-tailes and bought and HR 12-gauge single shot shotgun (boy did it kick), but didn’t catch on to what I needed to do to find a buck. During the last year of my military service I enjoyed some good fishing in Back Bay just south of Virginia Beach, my last military residence. Even caught a sea trout in Chesapeake Bay along the pilings of the 17-mile long bridge leading to the Eastern Shore. I stored my boat in a mini-storage building in town and pulled it out on weekends, specializing in catching large strings of pan fish, usually crappie, bluegill and an occasional largemouth. Got married (and divorced) and tried living just south of Monroe Louisiana for a while. Caught some nice crappie around the stickups in those Louisiana reservoirs and shot a bunch of snakes in the canal on my in-laws ranch. Planned to join a hunting club and finally learn how to hunt white-tails when I finally realized that California was where I belonged. Hooked the whaler up to my pickup and hauled it all the way to California. Put three quarts of whiskey in my radiator to make it through Texas and had to put the boat on top of the truck to finish the trip after the trailer bearings burned out and I wasn’t about to slow down while somebody fixed ‘em. I decided to sell real estate for a living when a friend of mine suggested that it would be a good way to make a living until I figured out what I wanted to do for the long haul. That was over 30 years ago. I guess I’ve been a hunter who sells real estate on the side ever since. At home in California, the only thing left to interfere with my outdoor desires was testosterone and I can’t tell you how many good hunts were nullified by spending time with ladies who could always find something to do better than hunting or fishing – that and an unexplained desire to make money selling real estate. It wasn’t long after that, that we finally purchased some deer hunting property that has remained with us since that time. In fact after 25 years of co-ownership we finally own about 1900 acres on our own. Real estate was good to me most of the time. Yes, in 1982 and ‘83 I made less than zero, but on most years I did well. In 1986 (after a residential subdivision project produced a windfall profit) I decided to take some time off from selling and retired. In June I flew to New Jersey and spent a week at Tom Brown’s “Tracker” school. I had read his book on tracking and had to find out in person if he had the knowledge he claimed. Although I didn’t figure him out, I was impressed when a blackbird flew through the window into his classroom and landed squarely on top his head. Even more impressive was his reaction – none. I learned to identify most mammal tracks and how to figure out how the track varies as the animal changes speed. Tom Brown definitely knew his stuff. Later that summer, I drove off into the sunrise in my 1978 CJ7 (actually my brother owned half of it) with a small trailer towed behind. I spent the summer in Montana and Wyoming. For 17 days I hiked Wind River Mountains with a group from the National Outdoor Leadership School in Wyoming. I learned how to cook a decent meal from scratch with a camp stove. Not long after that I decided I needed to find a way to make some money or I’d have to go back to real estate. The solution was to write a book. I pondered the subject matter and concluded that I needed to write a book, telling waterfowl hunters about hunting waterfowl on California’s public areas. I would travel to every public area and write about it. My writing efforts consumed me but before another year was out, I was offered an opportunity to list and sell a sizable project with nine custom homes and the money was so much better than selling books one at a time for $19.95. One thing lead to another and it wasn’t long before I was selling more real estate and writing less. Being my own boss was much better than my previous practice. As a broker I spent less time justifying my work to others and more time dealing with important issues. Since 1990, I’ve worked exclusively on my own and that has been the difference. I finally found out how to make selling a lifestyle that worked for me. After trying out a few business names, I concluded that simple was best and decided to work under my name with no DBA, Rich Fletcher; Real Estate Broker became the name of my business. I had no plans to hire anybody to supervise. My office was just big enough for my computer, a small conference table and me. In 1993, I married Linda, and we have dwelled in marital bliss for the past 15 years. However, that’s not to say that I haven’t digressed. In 1995, my involvement with the Mule Deer Foundation led me to become Editor of Mule Deer magazine, the official publication of The Mule Deer Foundation and for three years that job took up most of my time, too much in fact and in 1998 I turned the job over to a good friend. However, that was no sooner over than the Chairman of the MDF Board of Directors called and asked me to fill the job of interim Executive Director, which I whole heartedly did for 19 months before the job search produced a full-time replacement. It’s a good thing they found a replacement because that job was killing me. Never try to save the world. In 1997, the State of California took our duck club under threat of Condemnation. (That means if you don’t sell it to us we’ll take it anyway.) In the end we got a great price and the right to lease the property back and hunt it anyway. In 2000 my brother, father and I purchased a section of land and after 5 years got it approved for endangered species mitigation. 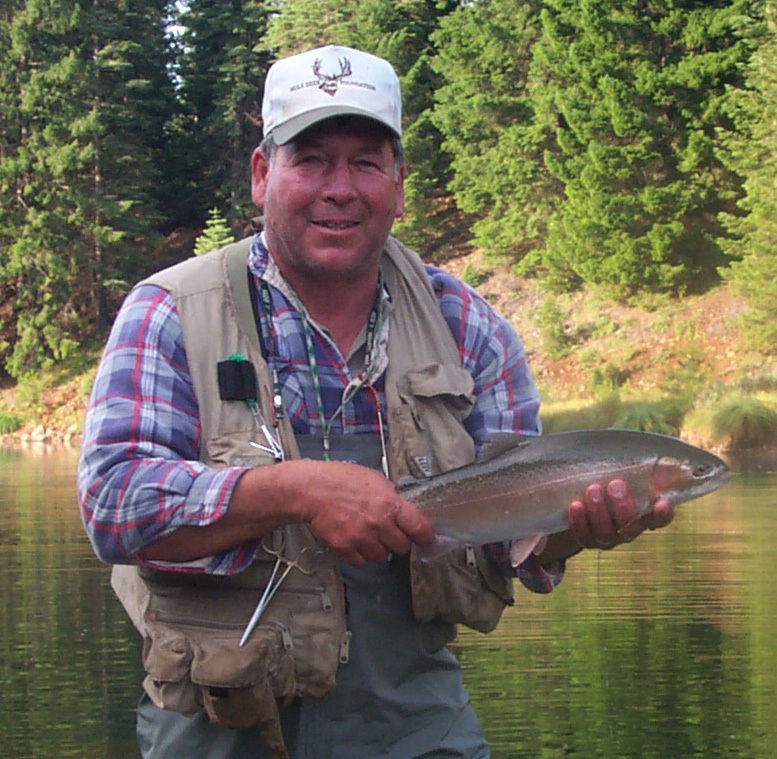 In 2005, after serving on the Board of Directors of The Mule Deer Foundation for 13 years, my final term was up. I’d seen the Foundation grow from about 2,500 members to about 10,000. It hadn’t been all roses, but it was a very educational experience. Serving on this non-profit board was very rewarding for me. Along the way I sold a couple ranches and even managed to subdivide a parcel and purchase it only to have a local park district take it away through Condemnation (the Right of Eminent Domain.) It makes a good story. They offered $300,000 and I countered at $695,000. After two years and a weeklong civil trial, they paid $730,000 – but it cost me $100,000 in fees. Why didn’t they just work it out in the beginning? The experience was worthwhile, but it’s really tough sitting in a courtroom for a week and not saying anything when you know almost nothing being said is completely accurate. I don’t complain about jury duty any more. I had much sympathy for the jurors in the case. After a lifetime of local hunting I began to expand my hunting territory. In 1998, Rob and I hunted Alaska for Caribou and Sitka black-tailed deer. We went back again in September 2001, this time driving the Dalton Highway to Prudhoe Bay. In 2005, my wife Linda, and I traveled to New Zealand. I was pleased to have the chance to hunt for a red deer stag. In 2006, I bagged a nice stone sheep ram in BC and in 2007, Linda and I traveled to Africa. The hunting was super. There’s more, but that’s the gist of how I got to where I am today – at least hunting wise. For now I’m busy writing my blog and looking for ranches to sell. What next? hope you will be interested in a link exchange. Just stumbled into your blog. Wow, some of those beautiful pictures about bring tears to my eyes. Thanks for Wright’s Lake and many other great times. If I didn’t have to swim 1500 meters and run a 5K this afternoon I’d write more. All the best. Great site. You sure know a lot. I wish you would start a hunting school. I’ve angled the U.S. from the Kenai River in Alaska to Biscayne Bay, and from Maine to So. Ca., but I never have learned how to hunt. I’d rather pay to learn how and not be a “greenhorn” when joining a hunting club than pay for venison at the specialty meat store. How about it? Take a hunter safety course and begin the journey. Hunting Ducks and Geese by yours truely. You might have to work hard to find that one, but it’s available on line via the resale market. It’s not bad. Great stories and history, I am going to be going to the Calif Fish and Game – Game Warden Academy in Jan of 2010 and if I make it through my first assignment is Livermore. I also have a real estate brokers license and my own company on the side. Have any books left? I need one. just found your blog as i was reading about tule elk in california. and gosh, I was tickled to read about your experiences with Tom Brown and NOLS, as I have been working as an outdoor educator for the last ten years with a small school based in southern Utah. our mission is, in part, the “preservation and teaching of primitive and traditional skills” such as tracking, trapping, friction fire, etc. I’m a beginner hunter. I took my first big game, a mule deer, in 2007 with my bow. I’ve been trying for Rocky Mountain elk since then, no luck in 08 or 09 but finally this year took a spike bull with my bow. Both in Utah. but seeing as I grew up in the bay area, I was thinking about trying for a feral pig this winter or spring in my home state. anyway, perhaps you could offer me some advice on how to get started! Wow! Thank you for sharing and for the inspiration! Great and engaging story, A fun read. A man with a purpose, hunt and fish and then do it some sore. I will continue to read your chronicles. Keep the spirit alive brother. And, yes….Go Navy. I finally got around to visiting your blog. I know nothing about hunting so maybe one time I can buy you a coffee and we can chat??? I’m a coffee drinker and I like talking about hunting, so pick a time and we’ll do it. Hello Rich, fantastic bio, it has been a while since are last visit; let’s have a cup of coffee sometime ! Hey Rich, Sorry to ask a question in this forum but I can’t find a way to send a private message. I read your book about duck hunting recently (I found a used copy on amazon). I have been hunting the bay area for the past few years and noticed that in your book on the section for grizzly island you made a comment about it being a “fair weather” area since it is in a delta/bay. I have not heard much about the difference in hunting near a bay regarding weather and was curious if you had any more insight. On a recent “perfect duck hunting day”, (ie rain, wind fog etc.” in napa, my buddies and I watched the weather do nothing for us to get the birds down. This is a great blog. Thank you for sharing your story. Thanks Kris. It’s nice to receive positive comments. Happy New Year. Rich – what a fun read. Thank you for taking the time. I am trying to get my boys into hunting [particularly boar]. While I was looking online to see where I could take them for easy trips in the Livermore area – I’ve suddenly become interested in real estate! Best wishes and thanks again for sharing.